Graduate and upper undergraduate students. 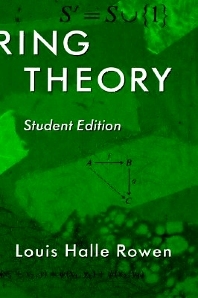 Introduction: An Overview of Ring Theory. Table of Principal Notation. General Fundamentals. Construction of Rings. Basic Structure Theory. Rings of Fractions and Embedding Theorems. Categorical Aspects of Module Theory. Homology and Cohomology. Rings with Polynomial Identities and Affine Algebras. Central Simple Algebras. Rings from Representation Theory. Dimensions for Modules and Rings. Major Theorems and Counterexamples for Volume II. References. Index of References According to Section. Cumulative Subject Index for Volumes I and II. Index.